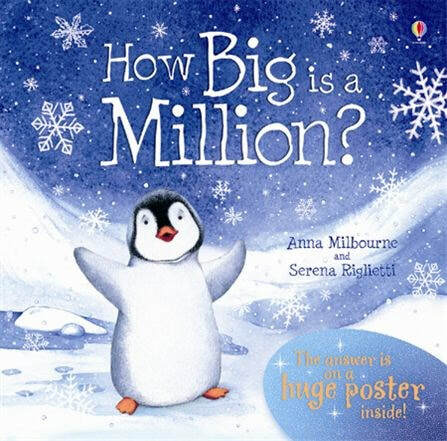 Anna Milbourne's ‘How Big is a Million?’ (2007) is a wonderful book to introduce the concepts of large numbers and place value to young children. The story follows Pipkin the Penguin who wants to discover how big a million really is. Throughout the story, Pipkin gets to see how big ten, a hundred, and a thousand are, but returns home disappointed as a million is nowhere to be found, until his Mama finds a perfect way to show Pipkin how big a million really is. Illustrations by Serena Riglietti are super cute, and the visual representation of numbers ten, a hundred, a thousand and a million are accurate. It is evident that the author, illustrator, the designer, and the publisher took a great deal of care to ensure the mathematical accuracy, particularly of the one million stars on the enclosed poster! One way that could help to make this book an even more amazing tool to teach young children the concepts of large numbers and place value is to find a way to embed in the story three other numbers: one, ten thousand and one hundred thousand, in order to give children a sense of number progression. Currently, the sequence jumps from ten, a hundred, and a thousand to suddenly a million. In terms of diversity of the characters: Pipkin the Penguin, the main character, is a male character, so are secondary characters, such as the seal. Having more female characters (with dialogue) beyond the Mama character would help to achieve gender balance in mathematical stories. All in all, we highly recommend ‘How Big is a Million?’. Recommended for children aged 7+ years old.